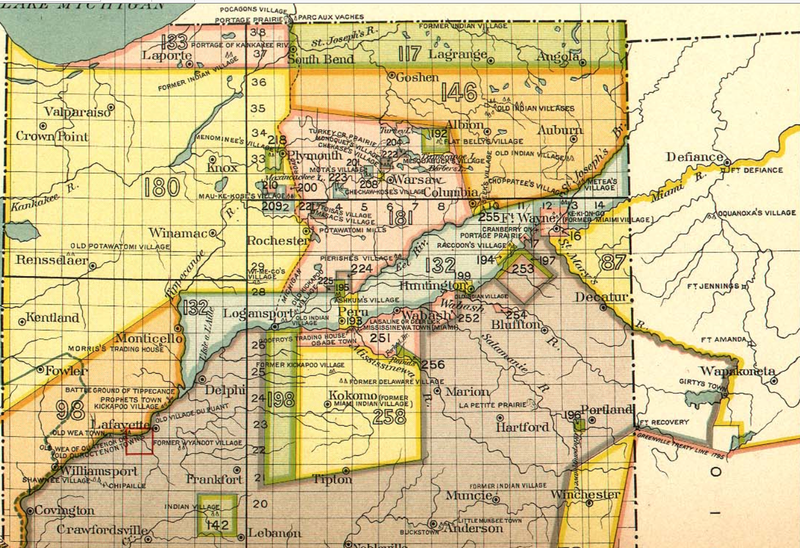 This collection provides maps of the land cessions made by American Indian Nations during the interval between the formal establishment of the United States and 1894. It consists of all sixty-seven maps from Indian Land Cessions in the United States, compiled by Charles C. Royce and presented as Part 2 of the Eighteenth Annual Report of the Bureau of American Ethnology to the Secretary of the Smithsonian Institution, 1896-97. The Report was printed by the Government Printing Office in 1899. Unfortunately, it does not include any of the earliest cessions, before the Revolutionary War. This means that Virginia, for example, and most of North Carolina are missing from the maps. However, in many states, locations of current and former villages are clearly marked, such as this map of Indiana. Hat tip to Yvonne for the link to the maps. This entry was posted in History, Maps. Bookmark the permalink.